Having trained as a Primary School teacher and then gaining an additional qualification to specialize in the teaching of 2-5 years olds, Mrs. Ramsay is exceptionally well trained to teach chidren. Her experiences of teaching English as a 2nd language in NZ, Thailand and Korea give her a wide approach to the subject and an understanding of the difficulties that differing cultures bring to bear on the mastery of English. Her own difficulties/experiences in learning Gaelic at age 4, French at age 14 and Japanese at age 37 add to her understanding. 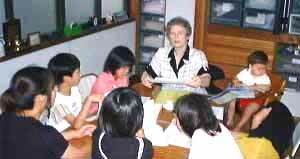 Learn in a group at her home in Tagawa or book her to come to you. She has a car and is a very capable driver.